The What: Crestron is now shipping its new AVF Hub (CEN-AVF-HUB) and AVF Hub International (CENI-AVF-HUB), which are engineered to facilitate communication between the Crestron Fusion Cloud enterprise management service and up to 15 rooms featuring the Crestron HD Scaling Auto-Switcher and Extender (HD-MD-400-C-E) and AirMedia Wireless Presentation Gateway devices. 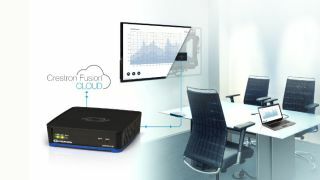 The What Else: The AVF Hub enables huddle rooms and other meeting spaces with basic technology to be integrated as part of a complete Crestron Fusion Cloud managed enterprise. Managers can instantly access basic room data, such as occupancy, display on/off, source selection, and easily update and manage rooms remotely without a control system or programming. Quick setup and configuration is facilitated through an easy-to-use web browser interface. The Bottom Line: The AVF Hub enables technology managers to easily deploy, manage, and support Crestron simple room systems over the network, and at a low cost per room. Multiple AVF Hubs can be deployed throughout the enterprise.